MobilePhoneApps4u offers a wide array of Mobile app solutions on a project basis – matching the plane of your exact requirements. We endow with technical assistance and advice, build and recommend solutions, and develop execution plans for offshore IT projects. 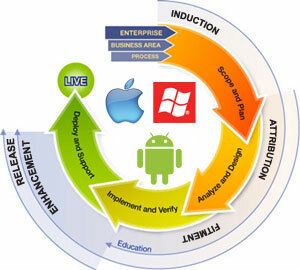 We follow a streamlined process of solution development. Development Process at MobilePhoneApps4u entails a full-proof course of action of requirement analysis, design, implementation, verification and maintenance. With our standardized practices and assertive approach towards development, we tend to operate meticulously and deliver competent results at different levels of execution. Though we follow our process sternly, we provide for all flexible options for a resourceful outcome. We have a highly determined and proficient team of developers, managers and analysts who make sure to put their technical approach over the right spot and align it perfectly with the methods while producing the solutions. This makes us deliver the newest of offering that seems no less than an invention. Our development labs are instilled with the right work environment that breeds innovative solutions without stressing much on the conventions and theories. We call it a user-focused development technique that we follow here at MobilePhoneApps4u. While crafting even slightest of detail or implementing any idea we collectively bring together different elements and align them with our sound architecture and project-specific schema to bring out the most robust solution for you. Another inseparable aspect here is our client's facet. We are transparent with our work and we make sure their remains no gap in communication with our clients. Throughout the process of development, we keep you informed with the progress and milestones of the solution. We let you closely follow your app being created from the initial sheer idea with our regular feeds and updates, while we are developing it for you. Through our flawless development methodology, we make sure that you get perfect result in time. Our streamlined process acts as our development guide, a driving force and a macro reference point that binds our development team together. It gives us the thrust to plan, develop and deploy a solution in best manner possible. 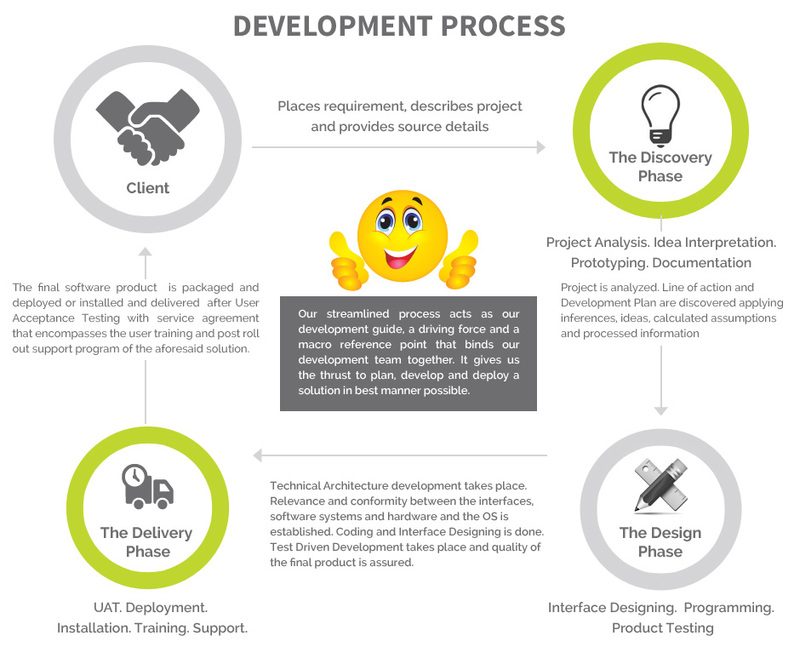 Our process broadly follows three phases including Discovery Phase, Design Phase and Delivery Phase. In which all the activities are followed from the project initiation to project completion. The very first thing that initiates the process of development is discovering the project needs and understanding the requirements thoroughly. Business Analysis allows us to kick-off the project acquiring the finest of details from the clients and assimilating them to form valid information. This includes inferences, ideas, calculated assumptions and processed information. This further helps us in analyzing the project needs and interpreting the idea to create business case for planned development. Prototyping is the next step that aims at ensuring the analysis done previously is right on target. In involves developing a sample that wholesomely defines the logics and functionalities and demonstrate the key features to the stakeholders and seeks approval on the same. In the design phase Technical Architecture development is the foremost thing. Architecture emphasizes on the business model of the solution and establishes its relevance with different elements and appraises it for the future validity. It also addresses the relevance and conformity between the interfaces, software systems and hardware and the OS. Software Coding is done to convert the designs into compatible codes and forms the substantial base for the product by developing a sound software program. Once the product has been coded we pass them to the Quality Analysis department for Testing. Our Testing process ensures that the project fall in conformity with different standard sets. I this process, we follow XP (Extreme Programming) practices which are based on Pair programming and Test Driven Development (TDD). This way we ensure an error-free product which serves high quality in every sense. In this process we make it sure that the product is compliant with the pre-defined functional modes and testing standards and is a perfect final product, ready to be delivered. Now when the project is all developed it is packaged and delivered to the client. Once the software or application is fully tested the solution is implemented at the client work environment. The delivery of a solution includes handling of all the deliverables including the knowledge transfer of the solution to its end-users in the form of training and learning program. Our deployment phase includes the implementation of entire solution in the operational facility of the client site and letting them work with the solution implemented in their work environment. With this we conduct UAT (user acceptance testing) and sign-off the project on the client's approval. With this our long-lasting association starts with the client. We provide our clients with full-fledges Post Rollout Support. Through our support and maintenance services we ensure that the software application works appropriately and is tuned well with the client's changing needs, from time to time. Any issues related to the functioning and software patches and bug fixes are provided during this phase to warranty user satisfaction. We also provide well-assorted functional up-gradations to the software to make it adapt with the changing technological needs.